I have a couple of these weird and wonderfully shaped pillows – they’re really comfortable and (allegedly) prevent snoring. I have no idea if this is true because hubby refuses to use his. Apparently pillows should be pillow-shaped. Anyhow, I’m using ordinary pillowcases on them at the moment but that looks pretty rubbish. Is there a pattern out there for these types of pillows or perhaps one of you clever ladies (or gents) could give me some tips on how to design one myself? I’ve just consigned my latest project to the bin! I decided to make the high-waisted straight skirt from the free pattern in issue 4 of “Sew” magazine. I checked the size guide in the magazine and decided to make the 14 as it gave the size to be 28″ waist and 38.75″ hips. A little snug for me but figured I could let it out a little. 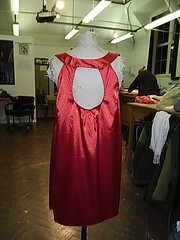 To cut a long story short, after stitching the back to the front I tried it on for fit. It was WAY too big! I did try taking in the side seams but I had to alter them so much the shape of the skirt didn’t look right. In frustration I unpicked the zip and threw the rest of it in the bin. So, is it the pattern or is it me? Normally I would measure the pattern pieces before cutting out because from experience I know that the envelope back isn’t always accurate. Annoyingly, I couldn’t this time as the pattern didn’t show any waist or hip placement markings and the pattern didn’t mention how high on the waist the skirt was meant to sit. I will attempt this skirt again and just cut it to a smaller size, but if anyone has any tips on how to measure a pattern without the markings I would be really greatful. 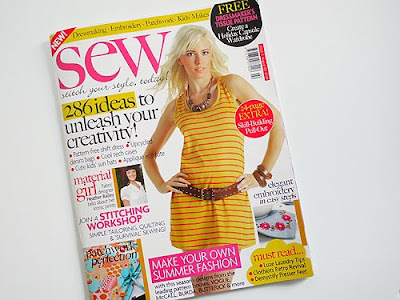 Sew magazine gives fab free patterns with every issue but it looks as though they all have this same little problem. So here goes the story ………..
My friend Sheena had a bit of a fashion dilemma. Hubby had a new job and they were due to attend his work’s Christmas party. She wanted to look good in front of his colleagues but couldn’t find a thing to wear. “The dress is quite nice” I replied “but I don’t think it’s your colour”. “I’m not keen on the colour myself” she said “and I don’t really like the hem either, but it’s the only dress I’ve seen that’s anywhere near what I’m looking for”. I spotted the price. They want £89 for it??? “I’ll make one for you” I told her “it’ll be the colour you want, the hemline you want and it’ll cost you a fraction of that one”. I showed her Simplicity pattern 3529 and she loved it. “The thing is” Sheena said “I’d really like it to be backless like the one in the catalogue, to show off my tattoo”. 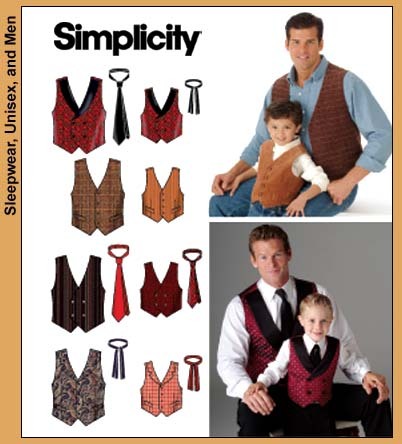 Hmm, now this pattern doesn’t have a backless version so I was going to have to work out how best to do it. This would be the biggest design alteration I’d made so I’d really set myself up for a challenge. But with a bit of help from my tutor Babs I managed it. 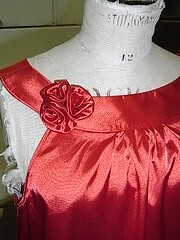 I created a toile first to sort out any “kinks” in my alterations (another first – I’ve never made a toile before). Sheena and I also decided not to have a tie-back dress as the ties would just obscure her tattoo, defeating the point of having a backless dress.